Social media has changed the public discussion about managing “privacy” online. As social media use has become a mainstream activity, there has been an increasingly polarized public debate about whether or not “privacy” can be dismissed as a relic in the information age. On one side of the debate is what might be called the privacy-is-dead camp. Its adherents take the view that if people are willing to share all manner of personal details about their lives on social networking sites — their physical location, photos of their children, intimate accounts of personal struggles and triumphs — then surely they must have abandoned any reasonable expectation of privacy. Some researchers have suggested that social network users are uniquely unconcerned about privacy; that over time, regular use of social media without any major negative experiences may lessen their concerns about sharing information. Other threads of the privacy-is-dead argument point to the relative ease with which people’s digital footprints and physical whereabouts can now be tracked and the great lengths to which someone must go to protect their anonymity online — or offline. On the other side, some advocates and scholars argue that the public still cares deeply about their privacy online but those sensitivities have been ill-served by technology companies that stand to profit from more widespread sharing and availability of personal information. Users may be more open with what they share because they don’t adequately understand enough about how their data is stored and used. And just because they are comfortable posting some information publicly does not mean they have quietly surrendered all control over the information they choose to share online. Yet, social science researchers have long noted a major disconnect in attitudes and practices around information privacy online. When asked, people say that privacy is important to them; when observed, people’s actions seem to suggest otherwise. Social network users are becoming more active in pruning and managing their accounts. Women and younger users tend to unfriend more than others. 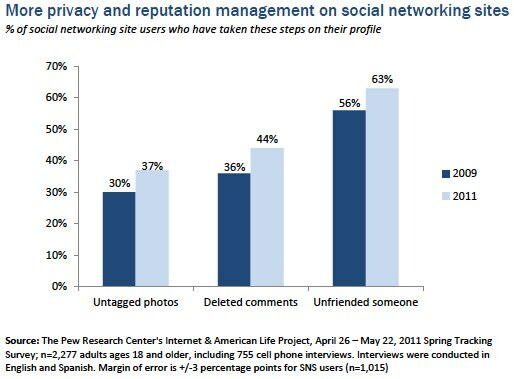 About two-thirds of internet users use social networking sites (SNS) and all the major metrics for profile management are up, compared to 2009: 63% of them have deleted people from their “friends” lists, up from 56% in 2009; 44% have deleted comments made by others on their profile; and 37% have removed their names from photos that were tagged to identify them. Some 67% of women who maintain a profile say they have deleted people from their network, compared with 58% of men. Likewise, young adults are more active unfrienders when compared with older users. A majority of social network site users – 58% – restrict access to their profiles and women are significantly more likely to choose private settings. More than half of social networking site users (58%) say their main profile is set to private so that only friends can see it; 19% set their profile to partially private so that friends of friends can view it; and 20% say their main profile is set to be completely public. Women who use SNS are more likely than men to set the highest restrictions (67% vs. 48%). Half of SNS users say they have some difficulty in managing privacy controls, but just 2% say it is “very difficult” to use the controls. Those with the most education report the most trouble. In all, 48% of social media users report some level of difficulty in managing the privacy controls on their profile, while 49% say that it is “not difficult at all.” Very few users (2%) describe their experiences as “very difficult,” while 16% say they are “somewhat difficult” and another 30% say the controls are “not too difficult” to manage. Social media users who are college graduates are significantly more likely than those with lower levels of education to say that they experience some difficulty in managing the privacy controls on their profiles. 11% of SNS users have posted content they regret. Male profile owners are almost twice as likely as female profile owners to profess regret for posting content (15% vs. 8%). Young adults are also more prone to say they regret some of their social media postings; 15% of profile owners ages 18-29 say they have posted content they later regret, compared with just 5% of profile owners ages 50 and older.